Kardos, Rickles & Hand, P.C. is pleased to announce that Abigail F. Tuttle has joined our firm as an associate. Abby served as a Bucks County Deputy District Attorney for six years focusing on child abuse prosecution. 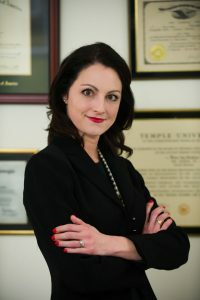 She has also successfully argued cases in the Pennsylvania Superior Court and the United States District Court for the Eastern District of Pennsylvania. As a District Attorney, Abby received both the ADA Recognition Program Award by the Network of Victim Assistance and received the John A. Wagner, Jr. Memorial Award from District Attorney David W. Heckler. This was for Abby’s innovative legal strategies and exceptional service in the protection of Bucks County victims of abuse. In 2013, Abby began her private practice in Bucks County and now focuses her practice on family law matters; including divorce, custody, support and complex domestic litigation. Therefore, Abby has the advantage of being an experienced trial attorney and is well versed in the Rules of Evidence. Because of this great experience, she is efficient in the Domestic Courts. Abby’s degrees include a Bachelor of Fine Arts in Acting from Emerson College, Boston, MA and a Juris Doctor from Temple University, where she received the Presidential Scholarship and two Distinguished Class Performance awards in Trial Advocacy. Abby is passionate about family law and advocating for her clients.